There's been a heavy focus on the Steam Team so far this series, but this episode puts the focus on Victor and Kevin, which is not only a nice change of pace, but also a very interesting dynamic to focus on. But how did it play out? As it turns out, it's probably the most sweet, genuine episode so far this series, and it gives us more of an understanding as to why Victor keeps Kevin around: they both care a lot about each other, in a similar way as a father and son care about each other. The plot itself is fairly humdrum: a character does something they shouldn't and gets into trouble. It's one that's been done a lot, by this show especially, but it works brilliantly here as it's reliant on the strength of the characters. And the characters are written really well. 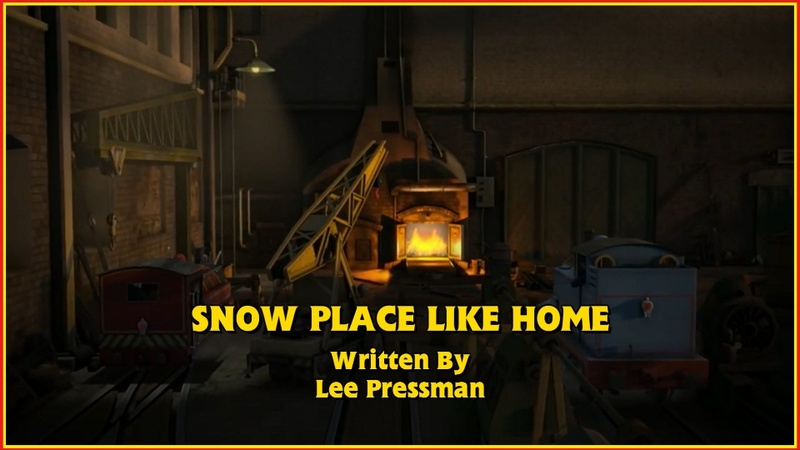 It's nice that they acknowledged Victor's old home again as it gave his hatred for snow more of a reason in the same way Donald and Douglas' liking of the stuff was back in the day. And, as a childlike character, it made a lot of sense that Kevin would like snow, and be carefree as far as not taking the threat of the conditions seriously. Victor's hatred for the snow also made his actions when Kevin disappeared all the more brave and admirable as you knew that he didn't want to be out there, but he knew he had to be as he didn't know what had happened or where Kevin really was. The only real problem is that Emily feels more like a plot device than a character here. I feel that, if Victor had been a bit more anxious to head out and Emily reminded him how much Kevin meant to him, she would've played her own part rather than just being there waiting for her piston rods. Also, Thomas' role could be called into question here. For one, why isn't he on his branch line? But beyond that, wouldn't Thomas have a bit of a rough journey trying to clear those drifts from hills? Wouldn't it have made more sense to send a bigger engine in snowy conditions similar to those depicted here? #S19XmasSnowHome Brilliant and heart-warming episode. Made me like Victor and Kevin a whole lot more. A huge favourite of mine. #S19XmasSnowHome I can't pinpoint exactly what the plot of this ep is meant to be, is it about Vic hating snow or Kev getting stuck in it? #S19XmasSnowHome I like the dynamic between the Victor and Kevin duo. Kevin's driver is crazy but the crash was very funny to watch. #S19XmasSnowHome Great episode for Victor and Kevin, even if Thomas' appearance would've been better with a narrow gauge engine. Been sat here waiting for the new episode, but apparently @SteamTeam3211 messed up but he's sent me a link to another version so let's go! Close down the whole railway due to snow? I think not. Percy just wants the day off. Lazy sod. If he wasn't dead, I'd have said Kevin is driven by Evil Knievel. Whoever it is must also work part-time as a crash test dummy. My wife drives safer than Kevin and she doesn't even know which pedal does what. Traffic lights are a lot more fun with her though. I know where Emily's new piston rods are. I put them there. Gets her out of the way for a while. @NWRMadMan they don't like - they make them drive Kevin. It all makes sense now. Perhaps he's actually a psychopathic killer. Oh, bugger it. Thomas made it to the depot. Good job I "accidentally" ordered the wrong piston rods. The life lesson there is: always have a back-up plan. How did Kevin not break that window? How's he moving if his driver's dead? How did this episode get green-lighted? Answers on a postcard. Good god! They've put Kevin on the fire! Can't say I blame them but I do have one question: is there room for Peter Sam? "Still no sign of my little..." I think it's a good job Thomas interrupted Victor when he did! A lot of rubbish. Only 1 positive thing: Emily being out of action. Now, if you'll excuse me, I'm going to visit the Steamworks. Looks fun. After a small blip, this episode is a return to form for the series. It's an excellent character driven episode that shows both Victor and Kevin at their best. Sure, it has its problems and, if I had to be nitpicky, it would've been nice to see a narrow gauge engine or two at the depot either as a cameo or saying a line or two about how strange it was seeing Victor out in the snowy weather, but they're all minor quibbles with a real heart-warmer.